Today I publish the complete text of The East End Preservation Society‘s formal objection letter to the Bishopsgate Goodsyard Proposals as sent to the Planning Officers at Hackney & Tower Hamlets Councils this week. There is still time to make your own voice heard and you can read the Society’s guide to How to Object Effectively by clicking here. We wish to register our strong objection to these applications for the proposed redevelopment of the Bishopsgate Goodsyard site. We would like at this point to state that this application has proved extremely hard to access and interpret, despite the commitment made by the applicant in its statement of community involvement. The Design and Access Statement alone is in three volumes and split into over one hundred and eighty separate downloadable documents on Tower Hamlets’ planning website. The document has no executive summary, making an already extremely complicated application even harder to penetrate. With this in mind we appreciate that your Council is accepting responses to these applications beyond the statutory consultation period of twenty-one days. The Bishopsgate Goodsyard is the site of a major Victorian London terminus, originally the main passenger station for the lines to Norwich and Yarmouth. Its construction began in 1839 under John Braithwaite. It was therefore part of the early, pioneering railway age in Britain. The original building – an elegant Italianate design – was redeveloped as a goods station in 1880-81 following the opening of Liverpool Street station in 1875. This new building had three storeys, a street-level basement, the goods station above that and a warehouse at the top. These buildings were extensively damaged by fire in 1964. However, the surviving structures were nevertheless later recognised by English Heritage as of great importance – both on account of the remains of the two-level goods station but also of the Braithwaite Viaduct (listed in 2002) built as part of the original development in the eighteen-thirties. Despite this recognition and a hard-fought conservation campaign, demolition of the unlisted structures was granted in 2003 – and the site was substantially cleared. Sir Neil Cossons, Chairman of English Heritage in 2002, commented at the time (with extraordinary prescience) ‘Bishopsgate Goodsyard is one of London’s forgotten treasures. To reduce it to a pile of rubble with no clear idea of what would replace it would be tragic, generating years of uncertainty and blight’. This recent history makes the surviving historic structures within Bishopsgate Goodsyard exceptionally important both to the history and character of the area and also in the wider context of Britain’s railway heritage. The site has been identified as the location for tall buildings in the Mayor of London’s draft City Fringe Opportunity Area Planning Framework (see below). Unhelpfully, the Interim Planning Guidance (IPG) does not give any actual indication of what height might be acceptable but designates the western end of the site, west of Braithwaite Street, as the location for tall buildings, with a graduation in height across the site to the east where ‘street’ scale buildings that relate to the scale of Brick Lane should be located. Furthermore, new guidance issued by the Mayor of London (see ‘Policy’ section below) makes it clear that new development in any part of London should take into account the character and history of the surrounding area. This objection is based on a number of grounds. We are concerned a) about the level of demolition of existing structures b) about the height, massing and design of the proposed new buildings and c) of the failure to deliver affordable housing on the site. - the setting of the five surrounding conservation areas (the Brick Lane and Fournier Street Conservation Area, South Shoreditch Conservation Area, Boundary Estate Conservation Are, Redchurch Street Conservation Area and the Elder Street Conservation Area) and the eighty-two listed buildings that surround the site. Substantial harm will also be caused to some of the undesignated heritage assets on the site including a number of nineteenth-century railway arches which survived demolition in 2003 and which are to be demolished under this scheme. The unlisted structures are arguably curtilage-listed – the appropriate tests for demolition should therefore be applied (NPPF 133). 66-68 Sclater Street, undesignated assets within the Brick Lane and Fournier Street Conservation Area are also proposed for demolition. This represents callous destruction of the historic environment and would result in the loss of an important piece of streetscape, which the conservation area designation is intended to protect. This is an exceptionally sensitive urban setting. As well as the designated and undesignated heritage assets within the Goodsyard itself there are five conservation areas which extend almost to the boundaries of the site (see above). These conservation areas contain some of the most outstanding survivals of historic townscape in London. It is inevitable that new development on the Goodsyard site will have an impact on these surrounding areas. Owing to a failure by the owners to adequately maintain the historic buildings on the site, the current state of the structures is poor (the two listed structures on site are on English Heritage’s Buildings at Risk Register). This has helped create an air of neglect which has a detrimental affect on the wider area. There is clearly an opportunity here for a new development which regenerates the urban fabric in a way that draws its energy from the character of the surrounding conservation areas – and learns from their success. We accept that the site was identified as a potential location for tall buildings in the Mayor’s draft City Fringe Opportunity Area Planning Framework and that the Interim Planning Guidance (Hackney and Tower Hamlet’s Councils, 2010) stipulated that the western extremity of the site should be the location for tall buildings. However, a tall building is generally defined as one that is significantly taller than its surroundings. This area is characterised by buildings which are generally no more than 6 storeys but with some warehouses and commercial structures which rise to 8. 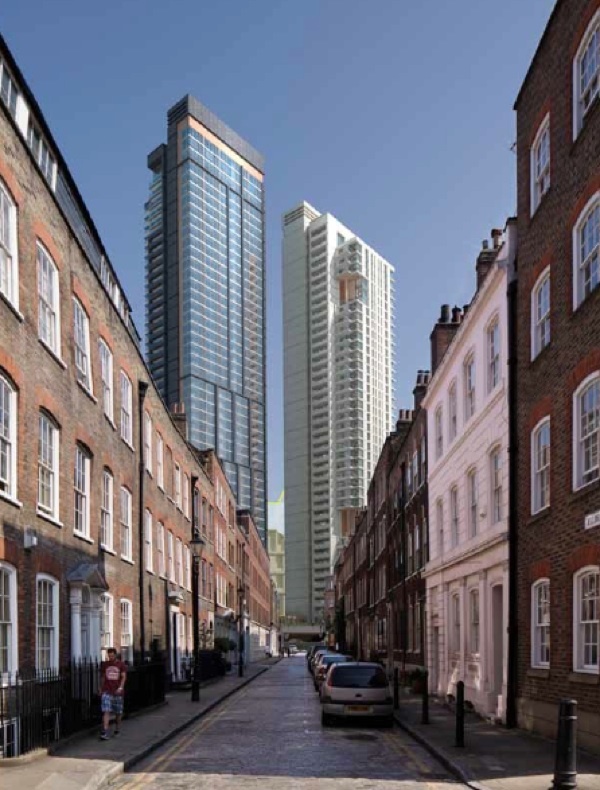 The proposed towers on site range from 15 to 46 storeys making them grossly out of scale with their immediate surroundings and representing an incursion of the City of London’s commercial district into this vulnerable and fragile ‘fringe’ area. The applicant’s Heritage Statement inevitably plays down the impact of the effect of the height of the new development on the conservation areas, with statements like ‘Fournier Street and associated streets will be unaffected for example.’ It’s very hard to believe that Wilkes Street and Brick Lane which both adjoin Fournier Street will be unaffected since both have direct views to the site and, indeed, the CGIs of the proposals from the surrounding streets tells a very different story – highlighting the overwhelming impact of the proposed towers. Towers F and G (of 46 and 42 stories) are the tallest and have the greatest and most far-reaching impact. They are both within a few hundred metres of the Elder Street Conservation Area which is made up predominantly of buildings of 4 and 5 stories including many important early eighteenth-century houses. One of the major associated effects of the height of the proposed development is the literal overshadowing of the surrounding areas. The applicant’s Daylight Assessment concludes that 43% of the buildings surveyed will have major reductions of sunlight. Unsurprisingly, many of these buildings are in the conservation areas to the north of the site, including buildings along Sclater Street, Redchurch Street and Old Nichol Street. This result speaks for itself in terms of the profoundly negative effect of the proposed tall buildings on the surrounding area. The design of those buildings which are covered by the full planning applications is very disappointing, failing to relate in any way to the character of the surrounding area. It is admittedly difficult to articulate and detail a 46 storey tower so that it responds appropriately to its historic setting. but even the lower blocks on Plots D and E appear bland and bulky. The very nature of very tall buildings means they have an uncomfortable relationship with the street, requiring larger footprints at the lower levels and tall podiums to support the upper levels. As discussed above, the proposals include a series of towers. At the south-west corner are the tallest at 46 and 42 storeys (with plant above that, increasing the height further). In the north-west corner is a large block (in plots A and B) which ranges in height between 10 and 12 storeys and would run along much of the length the site where it meets Bethnal Green Road, creating an overbearing presence on this northern boundary. In the middle of the site are two further towers of 34 and 30 storeys on a podium of lower blocks. To the eastern end of the site are a series of buildings ranging from 24 down to 9 stories with lower building around the perimeter of the site. The site includes a number of designated and undesignated heritage assets. The listed Braithwaite Viaduct is due to be repaired and converted to a shopping arcade, a use it is well suited to. The ‘shell’ of the grade II forecourt walls and gateway will also be repaired. We disagree with the assessment in the Heritage Statement that concludes that the boundary walls are not listed with the gate and forecourt walls – they are all of the same date and form the same structure. The walls are also an important part of the setting of the Goodsyard and the listed structures there. The original Goodsyard needed to be a secure area – and the surviving walls are therefore integral to its history. The walls also form part of the setting of the surrounding conservation areas – they define the historic relationship of the Goodsyard to its residential and commercial surroundings. The stretch along Commercial Street is particularly handsome and well preserved despite recent neglect. The permeability of this boundary could be increased by creating openings without such extensive demolition. The applicant attempts to mitigate the demolition of these walls by the restoration of the listed Oriel Gateway, a Building at Risk. This is disingenuous – the Oriel Gateway is a Building at Risk largely because the current owners have not maintained it and only the shell is proposed to be repaired as part of these applications. This justification for demolishing the surrounding walls should therefore not be taken into account. Vaults V1 and V2 which are behind the wall running along Commercial St (at a lower level) are curtilage to the gateway and forecourt walls and are due for demolition, along with vaults V3 to V11 and G9 to V1 which are unlisted but Victorian vaults all the same. These are on Plots F and G which is the proposed location for the 46 and 42 storey towers. The justification given for the demolition is the need to increase permeability to the site and to create wider public benefit (such as improved public realm and the provision of some public open space). Preserving and reusing these attractive historic structures (perhaps building a few storeys above them) would in our view result in a far more exciting, contextual and engaging scheme. The former Mission Room and Weavers’ Cottages are within the Brick Lane and Fournier Street Conservation Area. As the applicant states, the buildings are interesting examples of their type with the former Mission Hall, a rare survival highlighting the role of social welfare in the neighbourhood. Unfortunately, despite the proposals to repair these interesting survivals they will be cast into almost permanent shadow by the new blocks to south of them, ruining their setting. We support the Victorian Society’s objection to the demolition of 66-68 Sclater Street. These are handsome nineteenth-century buildings which the conservation area designation should protect. Hackney and Tower Hamlets are two of the London’s most densely populated boroughs with combined housing waiting lists of over 40,000 people. Remarkably, the applicant gives no commitment to affordable housing within this scheme (instead stating 10% affordable housing as an aim). This is in clear conflict with local planning guidance (see ‘Policy’ section below) and has already been criticised by the Mayor of London in his initial assessment. The purpose of the Interim Planning Guidance (IPG), published in 2010 by Hackney and Tower Hamlets Councils, was to ensure that the new development on the site achieved a number of basic principles. The proposals fail to achieve these basic design principles regarding character and height. The application comprehensively fails to achieve this. The overwhelming scale of the proposed buildings and their complete disregard for the architectural character and materials used in the surrounding areas means the development will loom over the neighbourhood and utterly dilute its distinctive character. However, the developers offer no commitment to providing a specific percentage of affordable housing. They state only that they will aim to provide 10% affordable housing on the site. This 20% less than the required 35% by Tower Hamlets and Hackney Councils for new development. The IPG’s principle of graduated heights across the site is adhered to in the proposals but the tall buildings are not restricted to the area west of Braithwaite Street. Buildings of 34, 30, 20, 17 and 15 stories in this area are undoubtedly also tall buildings in that they are significantly higher than the majority of the structures in the local area. Buildings of these heights are proposed for the middle and east of the site, all eastward of Braithwaite Street. The proposals therefore do not conform with the Guidance set out in the Interim Planning Guidance on building heights. The applications for redeveloping the Bishopsgate Goodsyard fail to take account of this guidance through an apparent disregard of the character of the surrounding area. The Goodsyard should be seen as an opportunity to reunite the surrounding areas with an exemplary development that is sensitive and contextual – worthy of the area that surrounds it. What is proposed will effectively undermine the fabric of this characterful and creative area and blight the surrounding conservation areas. The popularity and interest of Spitalfields and Shoreditch which is now so commercially attractive to property developers depends upon the flexible historic fabric and intimate urban spaces that lend themselves to reinvention – something the IPG attempts to capture. 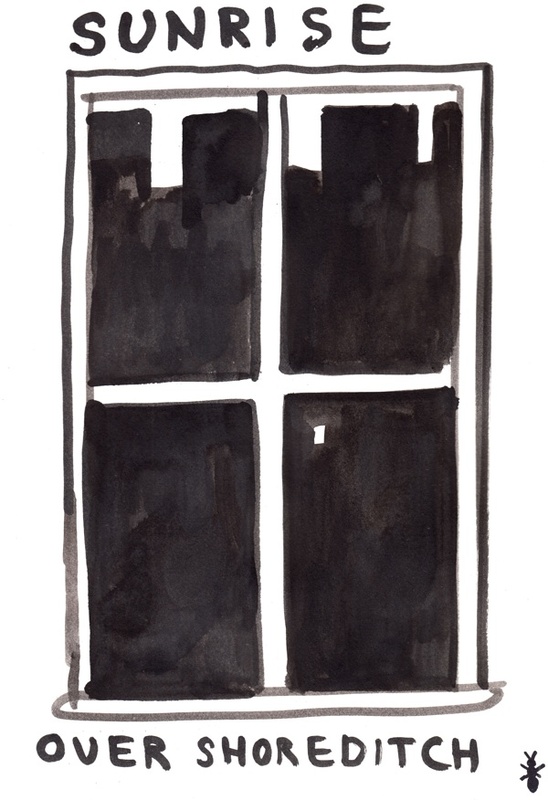 The subtle approach needed is totally absent in this vast, intrusive and alien development. As terminated type vistas (gone vertical, like a lift to the stars) goes, this proposal is pretty gross. Do read Rowan Moore in today’s Observer on the sick and unfortunate influence of theWalkie Talkie on the London skyline. In general the statutory 21 days for consultation is not usually an absolute deadline. And major developments take a long time to untangle and determine. Mostly you have to ensure you DO get in the mistakes and errors and etc. that the planning officer can use to ask applicants for more detail, better info, corrections. Comments get taken right up to planning committee time but once decisions are taken and recommendations to the planning committee printed in agendas they tend not to carry much weight. These upended ice-cube trays are making me dizzy. Provokes ground level disorientation…to me. A beautifully argued objection. The image ‘Sunrise Over Shoreditch’ also says it all. Will be joining you and supporting. She was intstrumental in helping make sure Christ Ch Spitalfields is still here ….. This is an exemplary objection to a crass, insensitive and grossly oversized proposal. And we of The Westminster Society (I’m on the executive committee) appreciate its fine attention to conservation principles that should apply everywhere in London. Thank you, and good luck! Thanks for this, I am in the process of responding. I would like to bring to everyone’s attention the Crossrail 2 proposal for The Angel, Islington. Recently it has come to light that Crossrail 2 are going to destroy the buildings between Pentonville Road & White Lion Street. This includes 18th & 19th century buildings of real historic significance. The idea appears to be to wipe-out our cultural & historic areas all over London! Can we stand together on this one too? Meeting 5.30pm 13th January Islington Town Hall. Impressively argued, cogent, factual and based on close-reading of proposals almost impenetrable in their structure and lack of executive summary. A masterly critique from the East End Preservation Society that cannot be easily ignored and deserves to be carefully studied by the planning authorities. Many thanks to everyone involved. We should all object to this. Good luck with the campaign! CR2 MAY destroy the buildings you listed – or it may not. Provided a reasoned objection is lodged well in advance, it is entirely possible to have the buildings & the railway – which we certainly need.